"A crazy combination of banana, peanut butter, bacon, and chocolate...yeah, hence the name. I was inspired to create this concoction by a burger known as the Elvis which came topped with bacon and peanut butter. Refrigerate leftovers." Place the bacon in a large, deep skillet, and cook over medium-high heat, turning occasionally, until evenly browned, about 10 minutes. Drain the bacon slices on a paper towel-lined plate. Cut each slice into 1-inch pieces while still warm, and set aside. Melt 2/3 of the chocolate in the top of a double boiler over barely simmering water, stirring to melt the chocolate. (Do not let water or steam drip into the chocolate or it will seize up.) Bring the chocolate up to no more than 110 degrees F (43 degrees C), measuring with a thermometer. Stir in the reserved chopped chocolate, remove from the heat, and stir off the heat until the temperature of the chocolate comes down to 88 to 90 degrees and most of the chocolate pieces have melted. Remove any unmelted pieces, and hold the chocolate over warm water at this temperature for dipping. Slice the bananas into 1-inch pieces, and cut each piece down the center to make half moons. Spread the bottom of each half moon with about 1/2 teaspoon of peanut butter. Stick the banana piece, peanut butter side down, onto a square of bacon, and skewer the banana and bacon together with a toothpick. 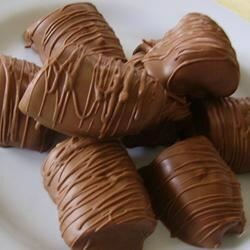 Dip the banana and bacon treats into the melted chocolate until completely covered; place dipped treats onto waxed or parchment paper until cool and set. Refrigerate leftovers. The combination of sweet and salty is really good, and you are sure to surprise your friends when you hand these out at your next event. And hey, get creative, try using jam instead of peanut butter, or white chocolate, or dust with coffee bean grounds after dipping...after all, these are Circus Freaks!